Buehrle is 15-17 against Cleveland with a career 4.87 ERA. Mark Buehrle hasn’t required much offensive support this season, but the Toronto Blue Jays’ bats have given him plenty and the tools for more are on the way. The veteran left-hander will go for his fourth win in as many starts Saturday against the Indians with shortstop Jose Reyes set to join the club in Cleveland for the second of a three-game series. However, Toronto (9-8) placed designated hitter Adam Lind on the 15-day disabled list after originally hoping he’d return over the weekend. Lind has missed the last three games with a lower-back injury, while Reyes hasn’t played since opening day due to a strained hamstring. "It’s big, he’s a big part of our team," manager John Gibbons told the team’s official website of Reyes. "The other guys have held their own and done a nice job for us. But he’s a key part of our offense." 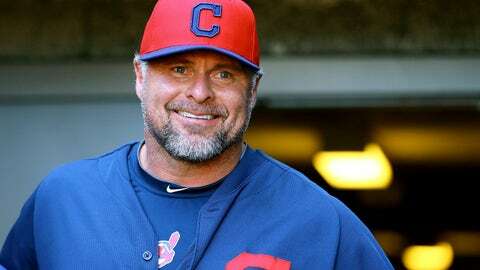 Indians designated hitter Jason Giambi will be activated from the disabled list on Monday after recovering from a fractured rib. Reyes, though, went 4 for 23 against Cleveland last season. Buehrle (3-0, 0.86 ERA) last won four straight starts with Miami from June 24-July 14, 2012. His third of this season was never in much doubt as he allowed a run on five hits in seven innings of Sunday’s 11-3 victory in Baltimore. He’s allowed two runs in 21 innings while walking two and striking out 16. Despite the dominance, a little extra support against the Indians couldn’t hurt. 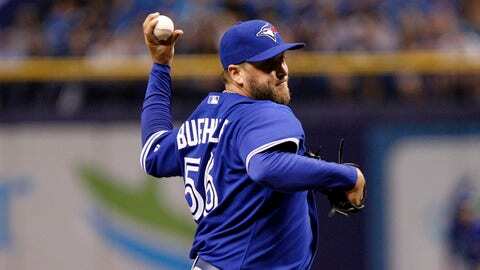 Buehrle is 15-17 against Cleveland with a career 4.87 ERA, which is his third worst against AL opponents behind the New York Yankees (6.02) and Los Angeles Angels (4.95). Buehrle’s former Chicago White Sox teammate, Nick Swisher, is 11 for 27 with eight walks against him. Swisher could use a favorable matchup as he comes in batting .185. "For whatever reason, some players get off to a cold start," manager Terry Francona told the team’s official website. "It always happens, and you don’t have a remedy or a pill to take." The Indians (7-9) counter with Corey Kluber, who has improved in each of his three starts, but opponents are batting .347 against him. Kluber (1-1, 5.40 ERA) allowed two runs in 7 1-3 innings of Sunday’s 4-3 win over the Chicago White Sox and settled for a no-decision. "He used all his pitches, worked ahead," Francona said. "He just basically really pitched a really good ballgame." Kluber has never faced Toronto or anyone on its roster, but the right-hander has won three straight starts at Progressive Field with a 6-0 record and 2.51 ERA in 11 starts there since May 31. Toronto snapped a two-game skid with a 3-2 victory in Friday’s opener. Third baseman Carlos Santana hit his first homer, a two-run shot in the bottom of the sixth that gave the Indians a 2-1 lead, but the Blue Jays took it right back in the top of the seventh on RBI singles from Munenori Kawasaki and Edwin Encarnacion. Blue Jays left fielder Melky Cabrera continued his hot start with a 4-for-5 night to bump his average to .333. With Reyes returning, Cabrera will likely move out of the leadoff spot. Fellow outfielder Jose Bautista went 0 for 3 but drew two walks and has reached base in all 17 games. He leads the majors with 20 free passes. Santana is 3 for 33 in his last nine games. He’s a career .326 hitter against Toronto.